You are currently browsing the tag archive for the ‘clocks’ tag. For many years now Archives & Special Collections has been working to get more and more of our archival collections online, available to researchers off-campus and across the globe. One of the ways we are doing this is by participating in the collaborative network of the Internet Archive, which provides access for the general public to historical collections that exist in digital format. We recently put up a set of product catalogs from the historical records of the E. Ingraham Company, which produced clocks and watches for well over a century in Bristol, Connecticut. 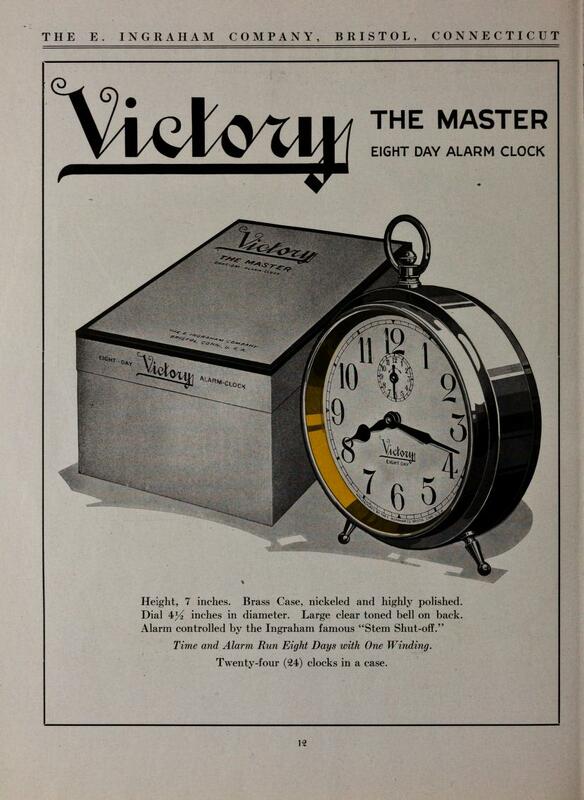 Researchers can access the catalogs directly from this link: http://archive.org/search.php?query=collection%3Auconn_libraries+AND+E.+Ingraham+Co and will see catalogs of the clocks and watches sold by the company from 1881 to 1940. I want to extend my thanks to Tom Koenig, Catalog and Metadata Librarian, for cataloging the items prior to the scanning and to Michael J. Bennett, Digital Projects Librarian, and his assistants Allison Hale and Kathleen Deep, for their expert scanning and work to get the items on the Internet Archive. This project is a great example of the ways the UConn Libraries staff collaborates on projects and I am grateful for everyone’s efforts. More information about the E. Ingraham Company, and the historical records that are in Archives & Special Collections, can be found in the finding aid at http://doddcenter.uconn.edu/asc/findaids/Ingraham/MSS19800034.html.